Alex Karp, co-founder and CEO of Palantir Technologies. The U.S. Department of Labor has filed a lawsuit accusing a high-flying Silicon Valley software company of systematically discriminating against Asian job applicants over the last five years. Palantir Technologies was co-founded by prominent tech financier Peter Thiel, with backing from an investment arm of the CIA. The Palo Alto, California, company makes data analytics software used by the U.S. military and law enforcement agencies, along with banks, insurance companies and other private clients. The lawsuit claims Palantir routinely eliminated Asian job candidates during the resume-screening and telephone-interview stages of the company's hiring process. The claims are based on a statistical analysis conducted by federal officials responsible for making sure government contractors comply with anti-discrimination rules. Palantir denied the allegations, saying the government's analysis is flawed. 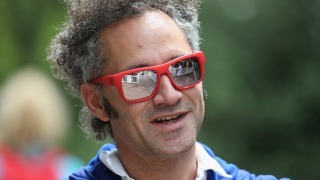 Palantir's chief executive is Alex Karp, who also co-founded the company.